Heart Pieces, the exhibition, commenced at Prospect Gallery, Adelaide, South Australia, on 21 June and finished on 22 July, 2018. This website was intended to act in partnership with the physical installation in the gallery, allowing greater accessibility for people living with vision or hearing disabilities. With the aid of a smart phone, visitors were able to use the QR code in the gallery that links to the content on this website. It is also intended as an opportunity to engage with the ideas both beyond the gallery and beyond the life of the exhibition. 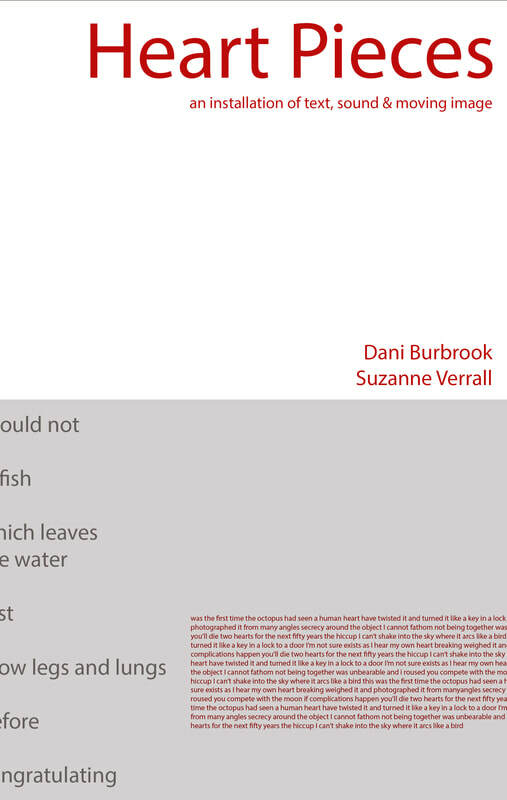 All images and content on this site are the property of the artists Dani Burbrook and Suzanne Verrall, the authors and creators, unless otherwise acknowledged. If you would like to use any of the work or ideas on this website, get in touch with us to discuss what you have in mind. We love that we have inspired you, but we want to ensure you credit us where appropriate. For information on copyright law, the rights of content producers and your obligations, these websites explains things well. WEBSITE DESIGNED & CONSTRUCTED by Sound Earth Design. Last edited 13th March 2019.